A broad chat with the creator of Gone Home. We recently caught up with Fullbright's Steve Gaynor to discuss launch, how the core AR recordings mechanic was developed, the changing state of the indie market, and the studio's future. PC Gamer: Obviously Gone Home was massively successful for you, critically and commercially. There was always going to be a big element of expectation on you guys because you set the bar so high. 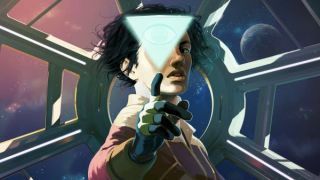 It’s a different game, similar in the sense of non-combat, exploration and all that kind of stuff, but specifically compared to Gone Home, how has Tacoma been received critically and commercially? Steve Gaynor: Well I think it’s like you said, we only have one data point to compare it to. I think there were a lot of things about Gone Home’s launch that were kind of 'lightning in a bottle'. 2013 I think was a very different time for smaller indie games coming out that were kind of reaching into the triple-A fidelity space. Also I think that we were lucky to be responding to what I think was a real desire for more games that were less violent or more focused on story or whatever. And so yeah, Tacoma’s release I think has been a much more realistic version of what launching a game is usually like. It hasn’t been a massive runaway explosion in the way that Gone Home was. It was a successful game and got a lot of attention but on top of that it was just the four of us making a game in our basement, so now we’re actually a company as well so the stakes are different and everything. It’s been a very different experience between the two games, but I think that we're part of this landscape where there’s so much good stuff to play. Like, I am behind on my backlog of just stuff that's come out in 2017 and I guess I have an excuse because I was shipping a game for a lot of it, but everybody’s busy, right? I feel like I don’t know anybody who isn’t, "Oh yeah, that came out too and I still haven’t gotten around to this". I think that we’re part of a changing landscape where people play more stuff more slowly, like over time. [Tacoma's] had a really positive response from people who have gotten to play it so far, and hopefully that means it continues to do well on a different timescale than if we’d been in the landscape of three or four years ago. Isolation is a consistent theme across both games. Why do you think you and Fullbright are so drawn to isolation? Is it a design thing or is it a personal thing? What is it about creating isolation in games which can be so powerful? Steve Gaynor: That’s a good question. I think that making being alone engaging, or having this isolated character being a compelling experience, is one thing that games can be uniquely good at, you know? When you try to think of other media especially, like film or television or something, there isn’t a lot of media that really focuses on someone being by themselves completely. I think that’s because it’s hard to express and make compelling in a lot of media, and games are really about the player’s individual experience. As at any small studio, but definitely with Fullbright, we need to do a lot with a little and being able to choose like “OK, our version of that is just you and the environment, and how can we explore every aspect of what you can do with that in a way that hopefully feels really full and complete and not kind of surface level but really making the most of the few elements that are there. It’s hopefully something that also plays to the strengths of, yeah a small studio to make an engaging experience without having to blow it out into a huge triple-A production. How did the 3D AR recording system develop? When we first started working on the game, we had the AR character recordings, but they were much more isolated and they were much smaller scale and you could do less with them. They were really much more of visual audio diaries, and we’ve seen those in a lot of games where you sort of walk in and a hologram appears and it says some stuff and you watch it and then move on, and we got that into the game. Once we arrived at that idea of all the characters are moving around you in this one big scene that exists in one area of the game, we had to change how we were writing those scenes and record with that in mind. As we started looking at it, seeing what we were doing with it, it really pushed us to make it a lot bigger and more complex and have the player be more directly involved, and led to the version of how we use them that you saw in the game, which is like—okay, this isn’t just like you come in and you click and you stand there and watch this animation and this character telling you something, you have to kind of think more broadly about the space you’re in and the scene that you’re in and what the timeline means in comparison to where all the different characters are. That meant that we really did have to change our production approach and consider how we were building these things, because once we arrived at that idea of all the characters are moving around you in this one big scene that exists in one area of the game, we had to change how we were writing those scenes and record with that in mind, and then build the fast forward and rewind system. But for us, I think that if we’re going to expand our scope in a game that we’re making, we think of that “do as much as you can with as few elements as possible” thing; if we’re going to invest in something by expanding it or increasing its feature set then focusing on something like Z-Recordings that give you access to moments in these characters’ lives, that’s the kind of thing that makes sense to say “Let’s build on that”. Let’s make that have as much to it as possible. And again it’s probably not fair to compare Gone Home and Tacoma but given it was so successful and it was you guys’ breakout hit it’s inevitably going to happen. I’m a big fan of Gone Home myself, but Tacoma for me is a better game. What do you think, do you think it’s a better game or is it fair to compare the two? Well, that’s the thing that’s been really interesting, you were talking about reception earlier and I mean Gone Home definitely in aggregate reviewed better than Tacoma. On some level I feel like it kind of doesn’t matter if Tacoma or Gone Home is a better game, depending on how you conceptualise that. So I guess what I would say is I think Tacoma is more interesting and has more going on in the mechanical gameplay space. You’re managing more things and I’m proud of the job that we were able to do of making what I think is a relatively complex way of thinking about these AR scenes pretty intuitive. We never really tutorialise it, we just kind of put the fast forward/rewind UI on screen and people just kind of get it. I think is really good but I think the flipside of it is that Gone Home I think connected with more people on a more visceral, emotional level of personal identification. I think that it really is this big open question of what makes something a better game, you know? Is it the construction of it, or how well designed, or how well considered different elements of it are, or is it just the feeling that people walk away from the game with? I think that Gone Home isn’t a worse game, I think maybe it’s a simpler game. I think it has much less to it in a lot of ways but maybe that’s a strength, honestly. You mentioned the landscape that Gone Home entered into in 2013, how do you think Tacoma would have fared entering into that landscape if Gone Home wasn’t there and Tacoma was your first game? I would think and I would hope that it would have done well. I also think that it’s a very strange place to come from to be making a follow up to something that is well known and was well received and to some degree I think has developed some amount of a cache or status around it in the intervening years, because it just means that Tacoma in a lot of ways couldn’t be judged on its own, you know? That’s something that I think is actually more true of some players compared to journalists. There’s probably more people who are just running into Tacoma either for its first time or they’ve heard of Gone Home but not played it, or they played it but it was a while ago. It’s a very strange place to be, kind of like you were saying, to say 'what would people have thought of this if it didn’t have a precedent before it?' Well that means if it theoretically came out in a different year or under different circumstances, and that’s impossible to really judge but it’s certainly... it’s very much a factor, you know? The term “indie” has changed quite drastically since Gone Home came out, do you think that the indie market at the moment is saturated? Well, that’s hard to say. I think that’s there’s definitely much more in the market now, I don’t know that saturation is necessarily how I would think about it. There’s a lot more out there which means a lot more people can have their interests served by different titles. But it also means that fewer indie titles are going to be 'the thing' that literally everyone’s buying. At some point, that means that the tide shifts and more people that are trying to release games are doing poorly than well—though that’s always true! If you look at the total number of games released on Steam or whatever, it’s gone up an enormous amount but I think also the number of good games that you might actually want to play has gone up a lot as well! I think that “market saturation” is certainly a bit extreme, but I also feel like we are at that point where for any given person who’s paying very much attention, there’s too much to play, so how do you become one of the things that people actually might believe in and put their valuable time into? The equation is, I think, way different. You’ve commented on Robert Yang’s blog on the past on social media, and one of his blog entries praised Tacoma but also touched upon its failings and I don’t necessarily agree with this myself but one of the things he raised was the fact that Tacoma has faceless characters that identified to players with colour and voice and things like that. Do you think that’s a fair criticism, that some players find it difficult to relate to Tacoma’s cast because they’re faceless? I’m not going to argue against anyone’s personal take on something like that, I think yeah if any given player feels like 'yeah, I couldn’t connect' for this that or the other reason, I think that’s totally valid. It’s a balancing act, right? I think there are people who are going to find Gone Home not to be engaging because it’s just 'well, nothing happens' or 'I never see this character, I only ever hear about them from others in this game.' I think in Tacoma, it’s definitely a different equation in terms of there are characters there, but they’re abstracted and simplified. I hope that our ability to project how we imagine the characters to be, our interpretation of those moments onto the characters, is more powerful than what would we could have put on screen as a team, even as a large scale, high-budget team. I think that there is the ability that players have to hear a voice and see body language and put themselves in that space. We have those abilities to see how that would be in our own head, hopefully in a way that, like reading a book, that bridges that gap in a way that’s unique to each of us as we’re playing. What is the future for Fullbright, what’s the next big project? I know you might not know exactly or be able to tell me, but has Tacoma’s reception altered your outlook or are you guys looking to the future once the dust has settled on Tacoma? Yeah, I think that as a studio you always have to take it one step at a time. We definitely are not a studio where we have already started pre-production on our next thing or anything like that, we’re a single project studio. There’s a lot of post-release support that you end up doing, as far as patches and all that kind of stuff. Also when you’ve been working on a game for three years, you need to take the time afterwards to get some distance and not necessarily just dive straight back into production. We’re working on some stuff internally and keeping people busy, but only as busy as we need to be. We’re kind of trying to take the time we need to consider what the next thing that we want to do really is as opposed to diving in. There is definitely some danger, or can be some danger, to making big decisions too quickly after you’ve done something like shipped a game that you’ve been working on for a long time. I was reading about The Chinese Room recently, and they’re taking a step back from game development at the minute. Dan Pinchbeck spoke about Dear Esther and Everybody’s Gone to the Rapture, and he said that they stumbled upon the “Walking Simulator” for want of a less hackneyed term, and he insinuated he doesn’t necessarily want to be pigeon-holed into making games like that for the rest of his life. Are you worried about being typecast as the “walking sim developers” or do you think doing a “procedurally generated roguelike” or whatever is within your scope? I think and I hope that we will continue making things that we feel excited about and that fit what we’re good at and what we’re interested in, and I don’t know if that will mean that it’s always a first person game or—like you’re saying—a game that’s about isolation or about discovering characters in an environment or whatever. Maybe yeah, maybe not. I think that what’s more important to us is what our team is invested in. I hope that if we make something that in and of itself is cool and exciting and that we believe in that there will be an audience for it. I don’t know how close to what we’ve done already that means we will do in the future. But I think that we do, that it is on us to surprise the audience and do stuff that, even if it feels close to or similar to or drawn from what we’ve done before, it also feels like its own new version of it.